IOPD has more reports and report structures than I’ve every seen. I’ve worked for the Navy and closely with another federal agency. But this just tops the cake. There are daily reports, weekly reports, site reports, preliminary expedition reports and expedition proceedings and I’m sure there are some that I’m missing. Tax dollars are paying for this, so the reports are public. Also, other scientists are very interested in what we are finding. Here is where you can see all the reports for this expedition. On the right hand side is the report section. I’m not trying to say this is overkill or unnecessary, I’m just glad that I’m not in this reporting structure. Also I must say that IODP is a machine in getting the reports out. They have perfected the art of producing reports. They have a team of editors and graphics staff ‘on the beach’ in College Station, Texas. There is a publications officer/yeoperson who works with the science team to have the reports and figures in the best possible form before we hit the pier. The preliminary report is due before everyone gets off the ship. You will be able to read it in less than 2 months from now. The preliminary report has a very quick turn around time. IODP for those of you who forgot (oh my!) or can’t figure out this acronym is the Integrated Ocean Drilling Project. “The Integrated Ocean Drilling Program is an international research program that explores the history and structure of the earth as recorded in seafloor sediments and rocks.” In order to create accurate and consistent volume material IODP has a team of editors. 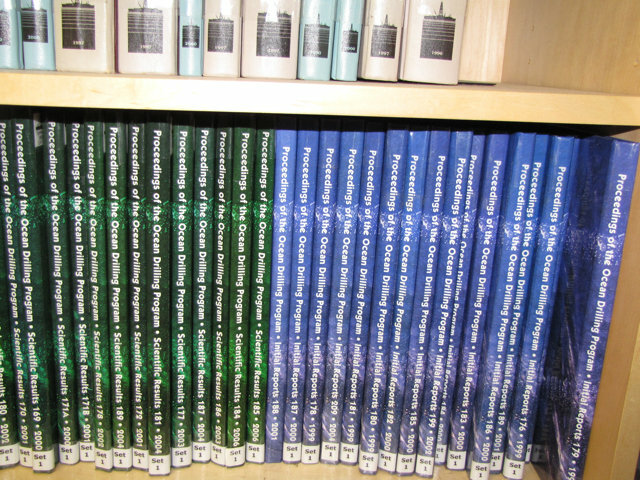 The editors, graphics and production team on shore revise, format, and confirm all text, figures and tables to produce the bound volumes of the proceedings. Like I said, it sounds like a well tuned machine. We have completed two sites and are now at our third site. That means three site reports must be completely done in 6 days. The first site reports were due last weekend and the next report is due today (I think). The site report for this third site will be due maybe 3 hours after the last core is on deck. Hmm. I don’t know how the scientists are thinking and writing, on top of processing the core. Everyone is looking sleepier and sleepier each day. We left the second coring site on Wednesday after a day of trying to clean the hole unsuccessfully, but not due to a lack of effort. Bubba and his drilling team did the best they could do in these slope sediments. We pulled up the pipe and scooted over to the next site. A half nautical mile using the dynamic positioning system. Now we are using a different drilling system (RCB) because our goal is to get into the hard basement rocks. First, we drilled down to 400 m below the seafloor, and then began coring. Coring means we are collecting core material. Drilling just means making a hole. We have site summary meetings also. Two minutes on each area – sedimentology, structural geology, then paleontology followed by paleomagentism, physical properties, geochemistry and microbiology. I love these meetings because I get the summary of what trends the scientists are seeing. I don’t get the visceral feeling of trends as we go down hole because I am not consistently looking at any one analysis of the core. I’m starting to see the story. A few shots of the amazing skies in the past 24 hours. At dusk and dawn. No animal sighting to report.